There’s a famous quote attributed to the great British geneticist J.B.S. Haldane. When asked by a theologian about his thoughts concerning the nature of god, he pithily retorted that the creator must have “an inordinate fondness for beetles”. 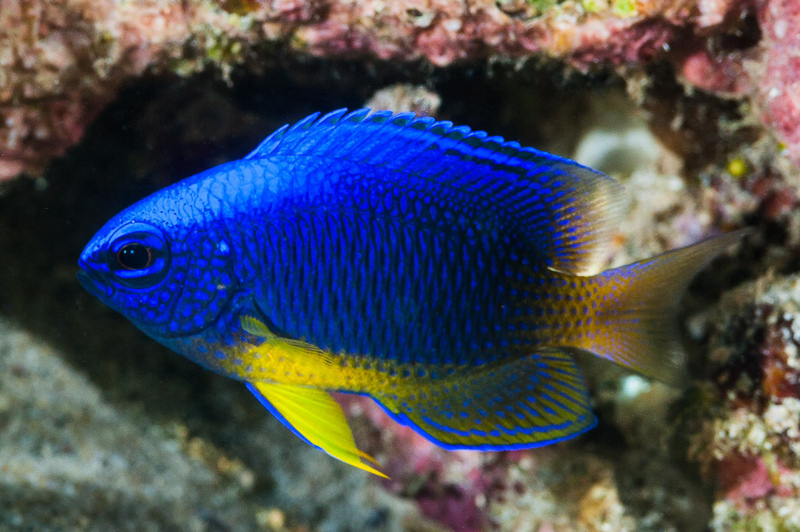 You could easily make the same argument for the many blue and yellow damselfishes in the world’s tropical seas. Take a moment and ponder how many there are: Chrysiptera cyanea, Chrysiptera taupou, Chrysiptera flavipinnis, Chrysiptera starcki, Chrysiptera parasema (and all its relatives)… Chromis flavicauda, Chromis insolata, Chromis limbaughi… many juveniles of Parma and Stegastes as well… Pomacentrus pavo and P. imitator and P. vaiuli fit the bill. 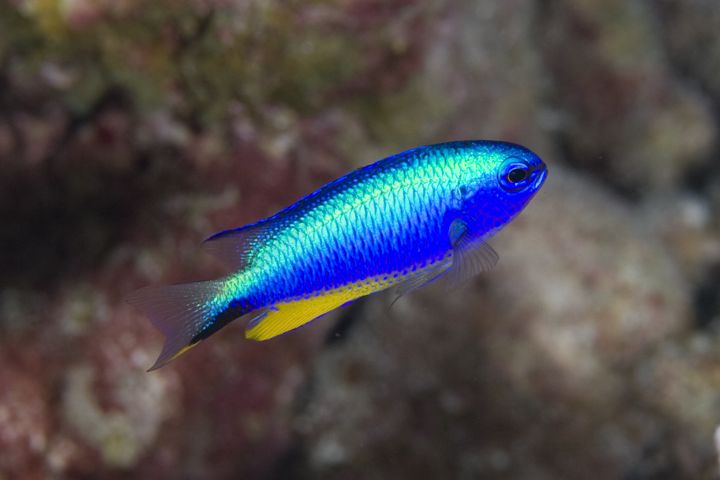 But perhaps the bluest and yellowest of them all occur among the complex of species known commonly as Neon Damselfishes. Owing to the sheer diversity of these chromatic cousins, misidentifications run rampant. Internet repositories like fishbase and iNaturalist are filled with photographs that aren’t quite what they seem. You’ll frequently find Chrysiptera masquerading as Pomacentrus or vice versa, and there’s even evidence of this problem existing within the scientific literature, as we’ll soon discuss. Today’s phylogeographic yarn was born from this confusion. 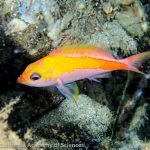 The Neon Damselfishes are well-studied and well-documented wherever they occur; these are, after all, extremely abundant and gloriously vibrant fishes which abound in the shallow tropical waters of the Indo-Pacific. They are almost impossible to miss in the wild, so there is naturally an excellent photographic record of them wherever they occur. 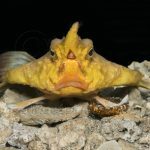 However, it bears mention that these fishes are oftentimes more commonly encountered away from pristine coral reefs, seeming to favor turbid habitats rich in open, rocky terrain. In their ideal niche, they are an ecologically dominant component of the fish fauna, frequently forming vast shoals numbering in the thousands. Presently, there are a half-dozen species recognized. 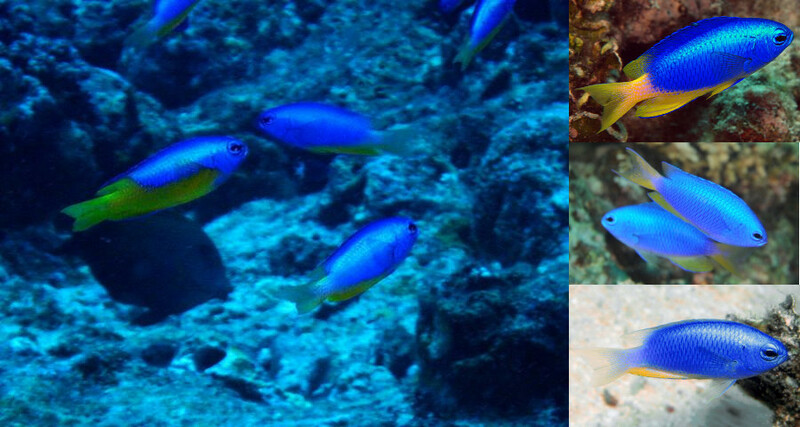 The first to be described was the Caerulean Damselfish (P. caeruleus) from the Western Indian Ocean in 1825, followed by the Neon Damselfish (P. coelestis) in 1901. The remaining taxa are considerably more restricted in range and have only been brought to light in the last few decades. 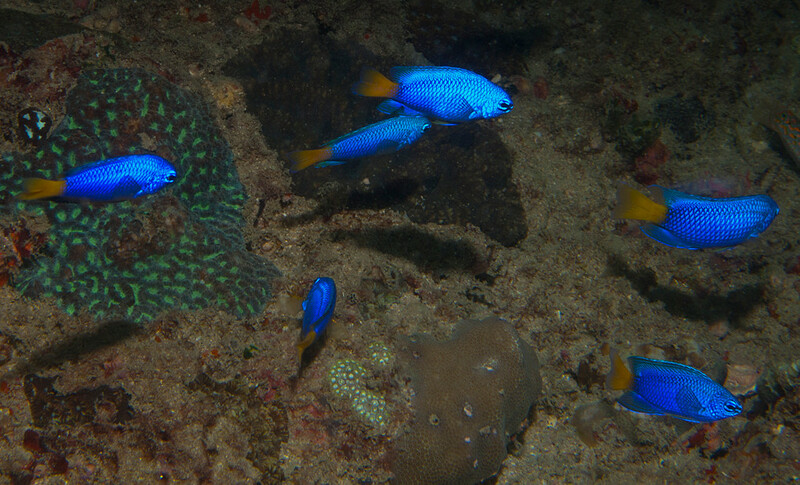 Allen’s Damselfish (P. alleni) is a distinctive fish reported primarily from the Andaman Sea. It honors pomacentrid guru Dr. Gerry Allen and was described in a 1981 edition of Tropical Fish Hobbyist. Next up were the Similar Damselfish (P. similis) and the Goldbelly Damselfish (P. auriventris), which first appeared in Allen’s monumental treatise from 1991, Damselfishes of the World. And, lastly, the Micronesian Damselfish (P. micronesicus) made a surprise entrance in 2014; it’s discovery was first heralded due to its stark genetic difference. Much of the difficulty we encounter with this group relates to just how variable they can appear. Aside from the distinctive P. alleni, the remaining five species all have overlapping phenotypes, while, morphologically, there are only miniscule differences to separate them. The most extreme example of this occurs with P. coelestis, which has individuals that can vary from being almost entirely blue to others which have a broad swath of yellow throughout the belly and fins. Some of this might be age dependent, as juveniles typically show far more yellow, and perhaps some of this plasticity could be explained by sexual differences, but there may also be an ecological or geographic component to this as well. For instance, specimens possessing one of these phenotypic extremes in color are typically accompanied by others sharing the same appearance. Find one blue P. coelestis, and you’ll likely find many, and vice versa. Making matters worse, it’s not uncommon to see more than one species in a given area, particularly within the Coral Triangle. 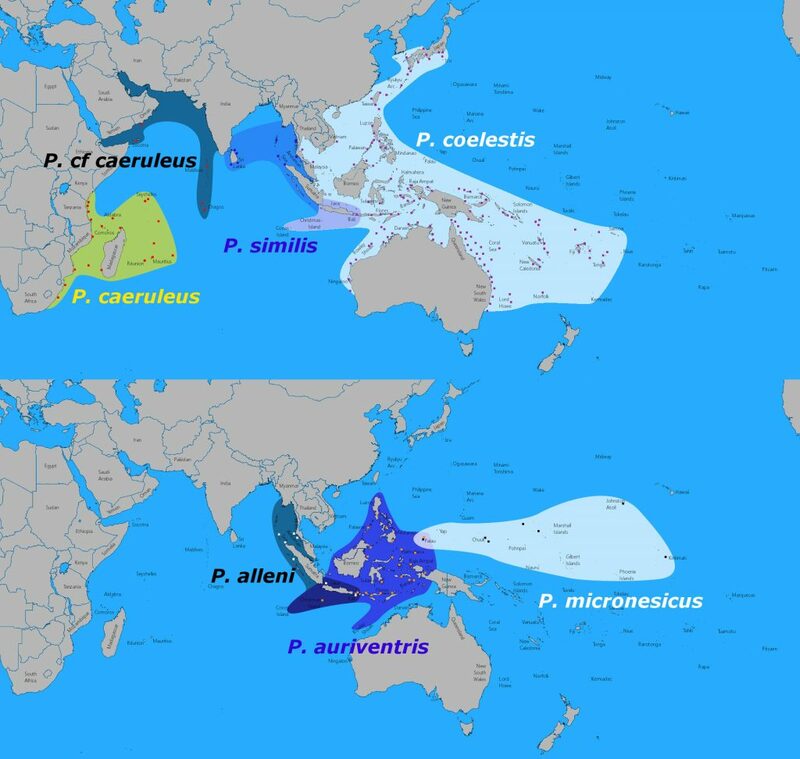 Places like Bali and Lembeh have been shown to bring together P. coelestis and P. auriventris in large, interspecies shoals, though, as reported by Allen 1991, the two tend to exist separately from one another. At Palau, P. auriventris has been observed swimming side by side with P. micronesicus. In such instances, we can expect that hybridization occurs with some regularity, and, interestingly enough, there may be evidence for this in the published genetic studies. Unlike most reef fishes, we actually have some fairly substantial morphological and molecular data for this complex from across its entire biogeographic range. In Sorenson et al. 2014, a pair of mitochondrial genes were used to construct a phylogeny for the group. This confirmed the current species-level taxonomy, while also hinting at a possible cryptic species existing in West Papua. However, their larger phylogenetic results were highly unusual when looked at from a biogeographic context. These authors found that the coelestis complex could be neatly divided into two main evolutionary lineages—one comprised of the Indian Ocean taxa and another for those in the Pacific. And this would be a perfectly sensible arrangement for many reef fishes, which often have a stark contrast along the same oceanic boundary. We generally refer to these as geminate species, and good examples can be seen with the Sailfin & Desjardin’s Tangs or the Zebra & Spotbreast Angelfishes. The same phenomenon can also be seen in more finely speciated groups. 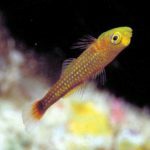 You’ll encounter prominent examples among fairy wrasses, flasher wrasses, pencil wrasses, anemonefishes, fangblennies, etc., where entire complexes of species are split along these same lines. But the important distinction with all of the examples I’ve listed is that never are these species fully sympatric. Put plainly, any geographic overlap between neighboring species is limited in scope, generally happening only in “suture zones” like Bali where regional faunae cross paths. And this makes some intuitive sense, as there has to be a viable mechanism that allows for species to coöccur without interbreeding themselves into a single homogenous organism. So let’s return to the Neon Damselfishes and the Sorenson study. How do we explain P. alleni and P. similis, both of which are limited entirely to the Eastern Indian Ocean, being more closely related to each other than they are to any of the Pacific Ocean taxa? We could ask the same question about P. coelestis and P. auriventris too. If these genetic data are accurately reflecting the evolutionary history of this complex, we would have to surmise that, in both cases, new species arose sympatrically. This would be a phenomenal discovery, as sympatric speciation has rarely (if ever) been found among such closely related species of reef fish. However, there’s a far more sensible explanation that I’ll put forth here. 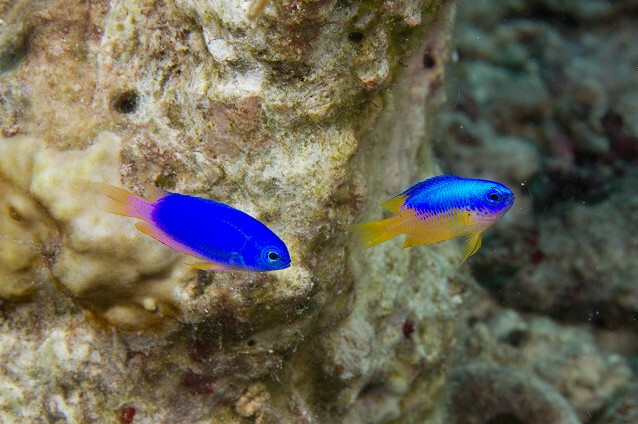 Instead of these blue and yellow damselfishes forming one large group divided by ocean basin, there are really two smaller ones that overlap in the Indo-Australian Archipelago. In this scenario, the peculiar phylogenetic results seen thus far are presumably just an artifact of a limited genetic data set, in combination with the hybridization that no doubt regularly takes place. And, as it turns out, there is some morphological data to support this contention. In this scenario, one group is comprised of P. alleni, P. auriventris and P. micronesicus. These are somewhat more elongated fishes, and they often appear noticeably shinier along their backs relative to P. coelestis and its ilk, especially when the two are photographed side by side. Unfortunately, this “shininess” is often lost in aquarium specimens, turning these vibrant creatures into a rather dim facsimile of their wild counterparts. The full extent of where these fishes occur in the wild is still imperfectly known, especially in areas like the Philippines and Borneo. Specimens from West Papua, Bali and Palawan have all been genetically linked to specimens of P. micronesicus from Micronesia, but this raises a number of questions: are there additional taxa needing description, and what relationship do these have with P. auriventris, which occurs widely in this same region. In turn, the remaining taxa—P. coelestis, P. caeruleus, P. similis—make up a widespread group stretching from Africa to Japan and Fiji. Curiously, many references make consistent mention of P. coelestis being present in French Polynesia, but this appears to be based on a misidentification of P. pavo, which has a considerable amount of yellow in that region. Reliable documentation, either in the scientific literature or from diver photography, is entirely lacking for what should be a fairly prominent fish, were it to actually occur there. In contrast to the aforementioned group, this lineage tends to be a bit duller (less “neon”, if you will) and just the tiniest bit taller in profile. The differences are subtle; Liu et al. 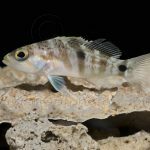 2013 found the body depth in the auriventris group was less than 40% of the fish’s length, while this was greater than 40% in the coelestis group. This latter group may also be ever so slightly fatter as well, with a width to depth ratio of 18.7% versus 16.6%. The differences sound subtle (and they very much are), but if you stare at enough photographs you will soon find that the eye is quick to spot these minor proportional discrepancies. 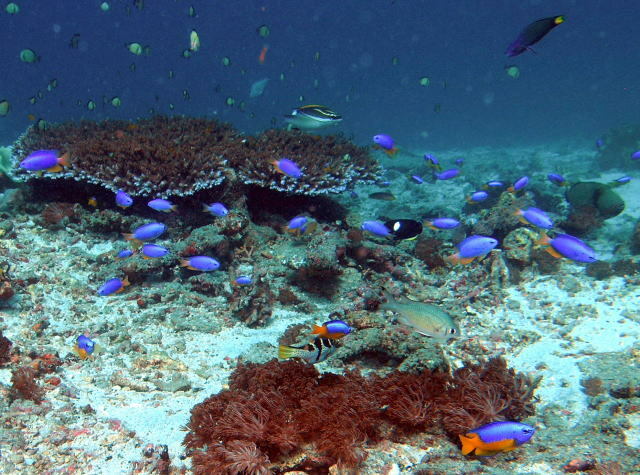 Now, if there was a point to this esoteric ramble, dear reader, it’s that even a fish as abundant and photogenic as the Neon Damselfish can be hiding mysteries from us. The evolutionary interrelationships of this complex may have appeared well-understood, but, when seen through a different lens (namely, biogeography), an entirely different story emerges. Many important questions remain regarding the true species-level diversity in this complex, especially in places like the Maldives and West Papua. 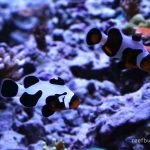 Unraveling the truth will require an even greater effort to get at the root of this conflict between genetics and morphology/biogeography, but these are important questions to answer, as they ultimately inform our broader appreciation for how the immense biodiversity of Indo-Pacific coral reefs came to be. Allen, G.R., 1991. Damselfishes of the world, 271 p. Mergus, Melle, Germany. Liu, S.Y.V., Dai, C.F., Allen, G.R. and Erdmann, M.V., 2012. Phylogeography of the neon damselfish Pomacentrus coelestis indicates a cryptic species and different species origins in the West Pacific Ocean. Marine Ecology Progress Series, 458, pp.155-167. Liu, S.Y.V., Ho, H.C.H. and Dai, C.F., 2013. A new species of Pomacentrus (Actinopterygii: Pomacentridae) from Micronesia, with comments on its phylogenetic relationships. Zoological Studies, 52(6), pp.1-8. Sorenson, L., Allen, G.R., Erdmann, M.V., Dai, C.F. and Liu, S.Y.V., 2014. Pleistocene diversification of the Pomacentrus coelestis species complex (Pisces: Pomacentridae): historical biogeography and species boundaries. Marine biology, 161(11), pp.2495-2507. I keep 6 Allens damsels in my 100 gallon, They bother no other fish in my aquarium of which I have many and some smaller than themselves. The do chase one another but no harm is ever done at all. These less aggressive of the Damsel family are unfortunately these often tared with the same brush as some of the bigger and more aggressive cousins. A shoal of at least 5 IMO is desirable and buying them while young to ensure they settle in together as unfortunately when mature they do not take kindly to new additions later on in life. They will also eat just about any marien fare offered however, they do best on regular small feeds. These are great little fish that are hardy,cheap and add great colour to the fish only or reef tank.